THUR MAY 23 GOLLING BUICK GMC KICK-OFF CHARITY CRUISE IN 4–8PM 1491 S LAPEER RD LK ORION. REGISTER 4–6PM. AWARDS AT 7:30PM. SAT MAY 25 DIXIELAND FLEA MARKET CHARITY CAR SHOW FOR VETERANS FOOD BANK 8AM–3PM 2045 TELEGRAPH & DIXIE HWY WATERFORD REGISTER 8–10:30AM. AFTER 10:30AM, NO JUDGE ENTRIES ONLY. JUDGING 9AM. AWARDS AT 2:30PM. FRI JUNE 14 ST. JANE FRANCES DE CHANTAL PASTORAL OUTREACH CHARITY FUND RAISER CRUISE-IN 4–8PM 38750 RYAN ROAD, S. OF 17 MILE ON E. SIDE. REGISTER 4–6PM. AWARDS AT 7:30PM. SAT JUNE 15 CANTON LIBERTY FEST 8AM – 3PM HERITAGE PARK, ADJACENT TO THE CANTON ADMINISTRATION BUILDING, 1150 SOUTH CANTON CENTER ROAD CANTON REGISTER 8–10:30AM. AFTER 10:30AM, NO JUDGE ENTRIES ONLY. JUDGING STARTS AT 8:30AM. AWARDS APPROX. 2:30PM. SUN JUNE 23 CENTER LINE LIONS CLUB CAR SHOW FUNDRAISER 8AM–3PM AT ABC WAREHOUSE 10 MILE AND VAN DYKE REGISTER 8–10:30AM. AFTER 10:30AM, NO JUDGE ENTRIES ONLY. JUDGING AT 11AM–1PM. AWARDS AT 2:30PM. THUR JUNE 27 GOLLING BUICK GMC CHARITY CRUISE IN 4–8PM 1491 S LAPEER RD LK ORION REGISTER 4–6PM. AWARDS AT 7:30PM. SAT JULY 20 VVA CHAPTER 154 CAR SHOW FOR MACOMB COUNTY VETERAN FOOD PANTRY 8AM – 3PM, LOCATION: VFW 1146 BRUCE POST 28404 JEFFERSON AVE S. OF MARTIN ROAD (11 1/2 MILE). TAKE I-696 E. TO 11 MILE ROAD EXIT, FOLLOW 11 MILE RD TO JEFFERSON, GO LEFT (NORTH) TO POST. REGISTER 8–10:30AM. AFTER 10:30AM, NO JUDGE ENTRIES ONLY. JUDGING STARTS AT 8:30AM. AWARDS APPROX 2:30PM. THUR JULY 25 GOLLING BUICK GMC CHARITY CRUISE IN 4–8PM 1491 S LAPEER RD LK ORION REGISTER 4–6PM. AWARDS 7:30PM. SAT AUG 3 GOLLING BUICK GMC SHOP WITH HEROES CHARITY CRUISE-IN 8AM–2PM LOCATION: DOWNTOWN LAKE ORION REGISTER 8–10:30AM. AFTER 10:30AM, NO JUDGE ENTRIES ONLY. CHARITY PANCAKE BREAKFAST 8AM–11:30AM TROPHIES AT 1:30PM. 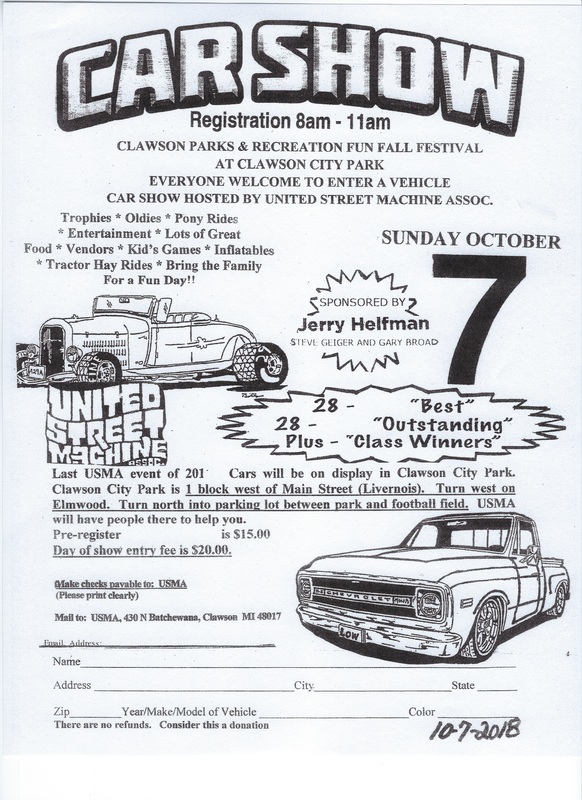 SUN AUG 4 CLINTON TOWNSHIP CRUISE IN WITH MORAN CHEVROLET 15 MILE & GRATIOT 10AM–4PM. REGISTER 8–11AM OR UNTIL LOT FULL. AWARDS AT 3:30PM. SAT AUG 31 DIXIELAND FLEA MARKET CHARITY CAR SHOW 8AM – 2PM 2045 TELEGRAPH & DIXIE HWY WATERFORD REGISTER 8–10:30AM. AFTER 10:30PM, NO JUDGE ENTRIES ONLY. JUDGING 9 AM. AWARDS APPROX. 1:30PM. THUR SEPT 12 BEACON SQUARE ORION CAR SHOW 4PM – 8PM 101 E. SCRIPPS RD ORION CHARTER TOWNSHIP N. ON LAPEER ROAD ON THE CORNER OF EAST SCRIPPS RD. REGISTER 4–6PM, TROPHIES AWARDED 7:30PM DONATIONS COLLECTED FOR ALZHEIMER’S ASSOC. 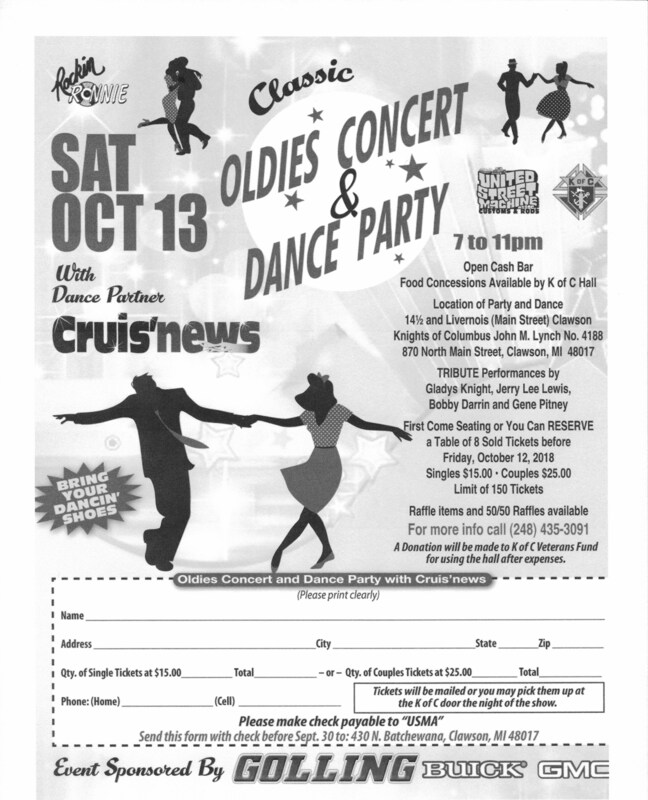 SAT SEPT 14 GOLLING BUICK GMC SUPER CRUISE IN GRAND FINALE 8AM–3PM 1491 S LAPEER RD LK ORION REGISTER 8–10:30AM. AFTER 10:30AM, NO JUDGE ENTRIES ONLY. AWARDS AT 2:30PM. SUN SEPT 22 USMA RIVER ROUGE FREE CRUISE IN MEMORIAL PARK DOWNTOWN. 8AM – 3PM MAIN STREET WILL BE BLOCKED FOR THE CRUISERS SOUTH OF SCHAFFER ROAD. REGISTER 8AM-NOON. 50 TROPHIES AT 2:30PM. 100 DASH PLAQUES, OLDIES, FAMILY FESTIVAL.